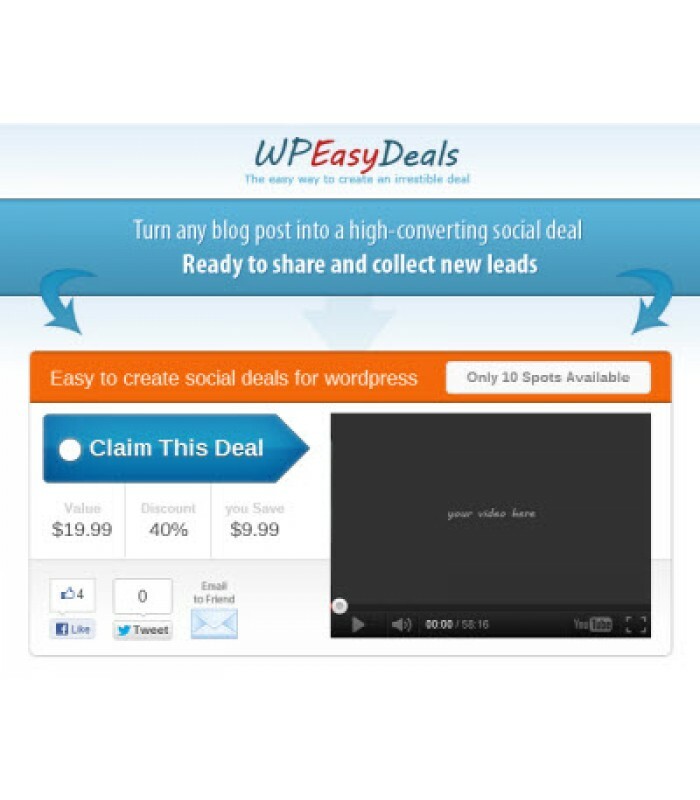 Easy to create Social Deals for WordPress. Unique WP Plugin- Discover the super easy way to create socially powered deals that collect leads, ready to share and display a sweet deal. Collect Email Leads- Add the HTML for any autoresponder service by just pasting the code and everything connects automatically. Add Video + More- Add your own video embed code to the email optin widget to showcase on the shortcode to increase optin conversions. Professional Design- Be confident that your deal will look great with full control over the design and copy and even add your own photo or video. Full Deal Shortcode- Create powerful social deals that showcase a photo or video and claim by signing up to your mailing list! Fully Optimized- To help convert the deals the shortcode is designed to look like the popular “Groupon” deal and share on social networks. Creative Techniques- Use the “Groupon” style to turn any wordpress blog post into a sharable social deal coupon and collect email leads. Customize Design- Choose the background color, customize all of the content using a simple and easy interface that only takes a few seconds.